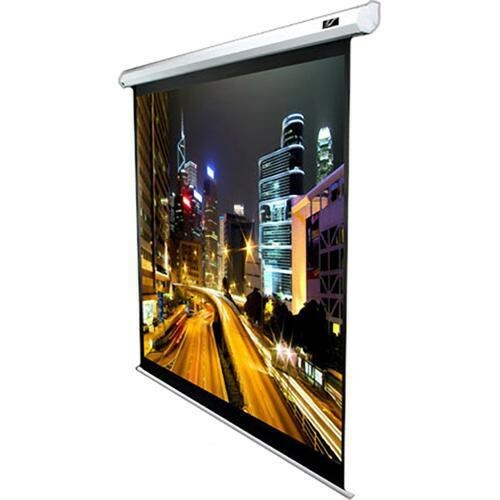 The Elite VMax2 Motorized Projection Screen is a simple and elegant screen for business or educational purposes. With its all-steel construction, white casing, and integrated IR and RF controls, this screen is a winner when it comes to your ability to maintain control over the projection environment. This series comes with standard 2-30" of black masking borders which give you an edge when it comes to eliminating "projection overshoot". The screen also has an excellent pre-set limit for vertical adjustments. This prevents "screen drift" and ensures that the screen stops at the desired projection height. The screen material is MaxWhite - a high gain material with a wide viewing angle (160°). The standard black masking borders give the screen a finished and professional appearance and help to keep your audience's attention on the screen. It is black-backed to increase image saturation as well as being textured which helps eliminate hot spots (moire). This surface is also easy to clean. In addition to the standard 2-year warranty,. Elite offers a 3-Year Parts and Labor Premium Warranty for All Government, Education, Military, and House of Worship Purchases. Box Dimensions (LxWxH) 120.5 x 5.9 x 5.5"
We do not offer this screen in a 240V Ac version.